San Salvador is the capital city with close to 1.8 million inhabitants in its Metropolitan Area. However, the large San Salvador area is composed of several municipalities. The city is a combination of colonial culture and an excellent modern city with various malls, many sightseeing destinations, for example the historical downtown with its local market, or the "Boqueron", located at Volcano of San Salvador. The town of Puerto de La Libertad is just 30 minutes away from the capital city. Its promenade and its pier are the main touristic attractions, and its one of the most popular destinations in the country. The main activity of the "Porteños" is craft fishing, and of course surfing. A special place to enjoy the local gastronomy based on all kinds of seafood. ​Internationally known as one of the best destinations for practicing surf, it's is also a place with a young atmosphere and flair. Bars, and restaurants organize concerts and surf competitions on the weekends. The diversity of international gastronomy, and the people from so many different countries make of El Tunco a very special destination, hard to leave behind. The Ruta de Las Flores is composed by five colonial villages in the mountains, all have a cool climate, and are a great place for relaxing. Surrounded by coffee plantations, the villages of Nahuizalco, Juayua, Salcoatitlan, Apaneca, and Ataco offer the visitor a variety of excursion and laid back destinations. On the weekends, the various restaurants organize food festivals in the villages central parks. A beautiful colonial city, a hour away in the northeast part of the capital city, It is a much-visited excursion destination because of its proximity to Lake Sushitlan. Suchitoto is known for its culture, art and architectural magic. As if being inside a time travel machine, the visitor feels back in the colonial times, its cobblestone streets, and its numerous restaurants, makes it one of the most popular destinations in the country. Is an exclusive, and beautiful beach, that has a wide variety of very good quality hotels. La Costa del Sol was, and still is a national touristic destination. 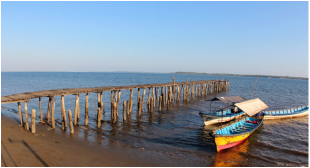 Only a few minutes away from the international airport, in the La Paz Department, or State, this peninsula has on a side one of the calmest waters and impressive mangrove forests in El Salvador, while on the other side there is a beautiful white sand beach. 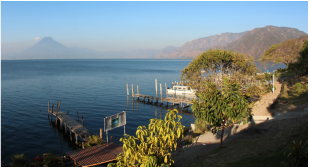 The Coatepeque Lake is of volcanic origin, and lays in a region known for its large volcanic complex. Nestled in a unique landscape, the Volcano of Santa Ana, or Ilamatepec on one side, and the Volcano of Izalco and Cerro Verde National Park on the other side. The various hotels and restaurants all built on stilts offer, besides local food specialties, water sports activities. Canopi ziplines Apaneca. Fundación Refugio Salvaje Park. The Ilamatepec volcano is the highest volcano in El Salvador. Tours and hikes leave from Cerro Verde National Park everyday to enjoy a spectacular view from above! La Libertad beaches are very popular for surfing, please contact us to take a lesson, or two, or three on how to surf with a professional certified surf instructor! Popular destination, unconventional atmosphere, combines the best of the gastronomy with the urban art. The new form of surfing with a row has come to Central America! Surfboarding with rudders (with or without teachers) at the sea, or at lakes available, and bookable. El Salvador is part of the Mayan World in the region. You can visit and explore the archaeological sites a few hours away from the city of San Salvador.